The main function of the homogeneous machine: to improve the uniformity and stability of the product. Increase the holding period, reduce reaction time to save a lot of catalyst or additive. The homogenizer is the new product developed by our company based on the up-to-date international technology of 1990's. 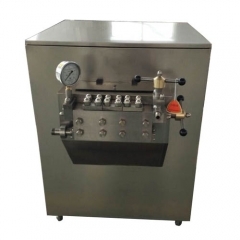 It is used to homogenize, emulsify, atomize and transport liquid materials whose viscosity is lower than 0.2P.aS, temperature is lower than 80 (liquid-liquid phase or liquid -solid phase). In working, with the advance and return movement of plunger piston, open and close of rebound valve and covered core inside the pump, to control the slight clearance between the valve head and valve base inside the adjusting valve effectively, so as to form strong high-pressure energy. The materials could fulfill the purpose of homogenization and emulsification under the instant action of combined force of turbulent flow, shearing, collision, and cavity. With the novel design, complete types, reliable performance, wide application scope, the product is the ideal equipment for micro-fabrication industries of foodstuff and beverage, medicament, chemical grease, etc. 1. Pressure control adopts two-stage mechanical pressure regulating, it is easy to regulate, safe and reliable. 2. The plunger piston adopts new techniques of wearproof alloy and flame plating alloy, ceramics, with the characteristics of anti-corrosion, wearproof. 3. The high-pressure sealing of plunger piston adopts the forms of self-caulking ring and V-shape sealing, with long service life. 4. Crank drive adopts one-stage drive mode, with stable running, small dynamic loss and lower noise. 5. Main parts and components are made of stainless steel and wearproof alloy, which conform to the requirements of food sanitation.